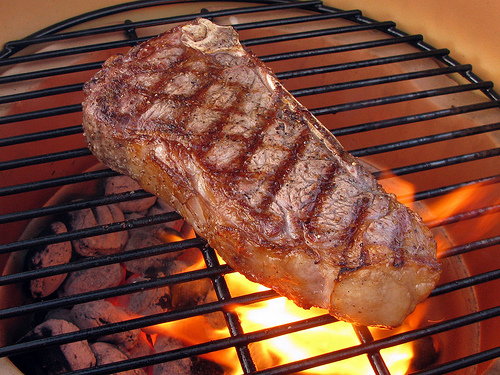 We like t- bone steak and its the best with this recipe.This is for a big cook out.But you could 1/2 this recipe . 1. Grind pepper, coriander seeds, and coffee beans in a spice grinder or pepper mill; add salt. Press spice mixture onto both sides of steaks, put in large plastic food bags or a glass pan. 2. Combine wine, steak sauce, soy sauce, garlic and paprika; pour over beef. 3. Close bags or cover dish and refrigerate several hours. Turn steak once or twice as it marinates. Remove meat from marinade, pat dry with paper towels. Reserve marinade. 5. Boil reserved marinade to reduce, adding more wine if desired. Serve with sliced steak. NOTE: This serves enough for a big cookout. Feel free to substitute smaller or fewer cuts of meat, reserving any extra marinade/rub for another occasion.